Halloween Nail Art from Ehmkay Nails, Recap! Halloween Night is upon us! Before you get all dressed up and have your plans, I wanted to give a fun recap of all the manicures I did this month! I am really proud that I completed this challenge and that you visited my little blog to see what I came up with! I also love the creativity it brought out of me! So thanks again! Wow, I can't believe we are at Day 13!! I also feel like I'm not ready for Halloween today, but oh well. I'm also getting sick, so that's a bummer. I'm so happy I was able to complete this challenge for myself. Onto the BbbBBBbboooooOOOOOoooookkKKKkkkkk. Without this book, would Hocus Pocus even exist? Nope! Oh hi!! I can't believe tomorrow is Halloween! Tonight's prompt is Nightmare Before Christmas! It's a quintessential Halloween movie. Although, we can argue it's also for Christmas! On to my nails! We are at the tail end of the challenge and I saved some favorite Halloween movies. First up is It's The Great Pumpkin, Charlie Brown! I loved watching this as a child, and I won't lie, I still watch it every year! It's so nostalgic and simple! So a while ago, I saw a post on Instagram from Chalkboard Nails that was a fun geometric pattern. I knew I would want to do it with Halloween colors, so that's why this prompt exists! I did actually change the original design quite a bit, but the shapes were inspired! I'm in love with today's manicure! I had no Halloween plates and now I have five! I'm usually the type to do full nail images but this time, I played around with the smaller images to create a haunted house scene! I actually got these flakes a while ago from Beauty Big Bang but I immediately ordered the Lina Halloween plate and that eyeball image was like, "Hey Michelle, stamp me over chameleon flakes." So I listened and waited and boy, am I happy?! I feel like it's not Halloween without a candy corn manicure. I really wanted to do textured candy corn, but alas, next year. It seems that this, my head is exploding with Halloween ideas! I've got a double candy corn look for today. Good evening! Sorry for the late night post! I did my candy corn manicure on Friday and loved it so much that I only took it off today! So I just finished my with manicure for today and I wanted to keep up! You'll see my candy corn mani tomorrow! For now, let's enjoy my mani for the next 2 days! Haha. Challenges are hard! But I really wanted to re-create my mani from 2 years ago and I'm so happy! I told you I would be back with some art and of course, I'm continuing my 13 Days of Halloween! I was super excited when Beauty Big Bang told me they released 6 new plates: 4 for Halloween amd 2 for Christmas and that they were sending them over! As soon as I got them (just a few days ago), I tried out 3 of the 6 plates! We now interrupt this Halloween programming for a beautiful and EXCLUSIVE polish from Stella Chroma that will be available through The Color Box. The Color Box is a themed box by color and this month, the color is rainbow. Not really a color, but why not? I'm so glad Stella Chroma got orange because orange is one of my favorites! I am loving this Halloween challenge, although I usually try to take the weekend off from the blog. October has not allowed that! So I was obsessed with my radial gradient in this manicure. I've actually never done one and I'm all about trying new techniques! Oh you knew Pusheen was going to be Halloween-based this month. You had to know it. I decided to be all out ridiculous and well, it didn't perfectly work out. Nail art is fun for me though, and it's all about trying things! It's Friday! I really mean it when I say 13 Days of Halloween! Hopefully you'll be inspired and create some of your own Halloween manicures! The Morgan Taylor Matadora collection may not have initially screamed fall to me, but then I realized how the colors were perfect for some vampire art! As you can see by title, I am doing a Halloween Challenge that I created! I have wanted to do this for a loooong time on my blog, but time always passed me by. Well, with proper planning, and getting up all my press obligations earlier this month, I was able to secure 2 weeks for just Halloween! I started on Monday with Halloween colored manicures, and now, I'm here with more traditional manicures. Maybe you'll want to join me for a mani or two? I'm really digging my theme of purple, green, orange, and black this week. But today is the day before my big Halloween challenge, where I'll get to the more obvious Halloween manicures vs these pretty, but more subtle manicures. Today's manicure is inspired by a plate! Ok, so I didn't redo the leopard nails, but I did do some Halloween plaid. Squeee. I love how these colors came together. I stuck with a China Glaze theme for this manicure! I am doing some epic Halloween manicures soon, but I'm doing some fun, cause I feel like it Halloween manicures right now! I had in my head to do some Halloween leopard, so that's what this is! Hello Sunday! Although tomorrow is Monday, I'm cool with that, because I have some fabulous lipsticks to wear! And you can too! Zoya has been branching out with makeup the last two years and they make a great lipstick. They are my go-to for work and now, Zoya is giving some fun options, to wear outside of work! I know that the title of this post sounds like a doozy, but it's literally what's on my nails, LOL. This past Wednesday, I randomly got the chance to go see Katy Perry, so why not? I don't really listen to her music anymore besides what's on the radio, but I really can't pass up theme nails and a concert. Just wanted to share a quick NOTD that I wore while my nails were growing out! I don't do glitter tips enough anymore, and this mani brings me back! Grab yourself a coffee, apple cider, hot cocoa, whatever you enjoy and sit back and enjoy my swatches and thoughts on the upcoming KBShimmer Fall 2017 collection. This one is special as it is a blogger collaboration! I was so honored to be a part of this collection. 12 different ladies, ideas, finishes, and we all came together for a fun and cohesive collection! So enjoy and let me know which ones you plan on grabbing this Friday, October 13! My polish purchases these days just aren't what they used to be, haha. When I saw the China Glaze Street Regal for Fall 2017, I knew I needed to golden mustard color, no question. 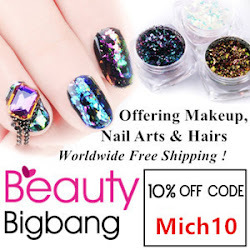 Then I received this glitters from Beauty Big Bang. My brain went off and said "Put these babies together somehow!" and I did! Don't forget to enter this awesome giveaway, for the Matadora Collection in Gelish! The giveaway ends Friday the 13th! Head to my post for full swatches and to enter! ENTER HERE! Happy Monday! 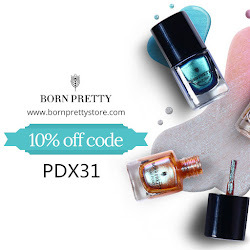 There's so many awesome nail polish events around now, and with that, comes special exclusives for you! The Indie Shop is this Friday, the 13th. Spooky! So I've got two polishes from Alter Ego that you definitely want to pick up! Can you believe we are at winter collections?! I still have one more fall collection to show you! LOL. But Zoya is showing off their newest Party Girls collection, which you can pick up starting next week! Remember when everyone was going crazy over those intricate mandala stones, painted in rainbow colors? Well, I've taken that concept for a muted fall color palette, featuring the #Instastyle collection. Good news: it doesn't take that long to do a simple mandala-like manicure when you limit your color palette. Let's take a look! So I apparently entered a giveaway over at Cosmetic Sanctuary and I won this set of Essie Treat Love & Color polishes! These are supposed to be neutral polishes with lots of vitamins and oils to help with brittle nails. I don't know about that since my nails aren't really brittle, but I've been wearing the art I did with them for 6 days and my nails don't feel weak! LOL. I always look forward to Jessica Collections, especially the Phenoms. They always have wonderful cremes, and this #Instastyle collection is no different! I have straight swatches today but I'll be back with art this weekend! I'm here with my first official Halloween look! I plan on having a ton of Halloween nail art all month, so I hope you're ready!! I wanted to use my favorite color from the Matadora collection to create a different palette of Halloween colors. Morgan Taylor Matadora Collection, Swatches and Review + Gelish Giveaway! I'm continuing Fall with more fall collections! I have to say, Morgan Taylor's Fall 2016 was one of my absolute favorites last fall. It's still one of my favorite collections! So I had super high expectations for this fall collection. So let's take a look. I shared with you some nail art yesterday that showed off this beauty! The theme for Polish Pickup in October is Mythical Creatures. I know Pam of Stella Chroma well, and I had a feeling it would be something from Harry Potter or Game of Thrones. She is a true fan! Well, she chose the Fawkes from Harry Potter to create this rich red shimmer! I'm welcoming October with a gorgeous red base and weirdly large sequins. This manicure is very costume-y and that's okay because Halloween is upon us! I get a very Harley Quinn feeling from this manicure, so let's get into it.